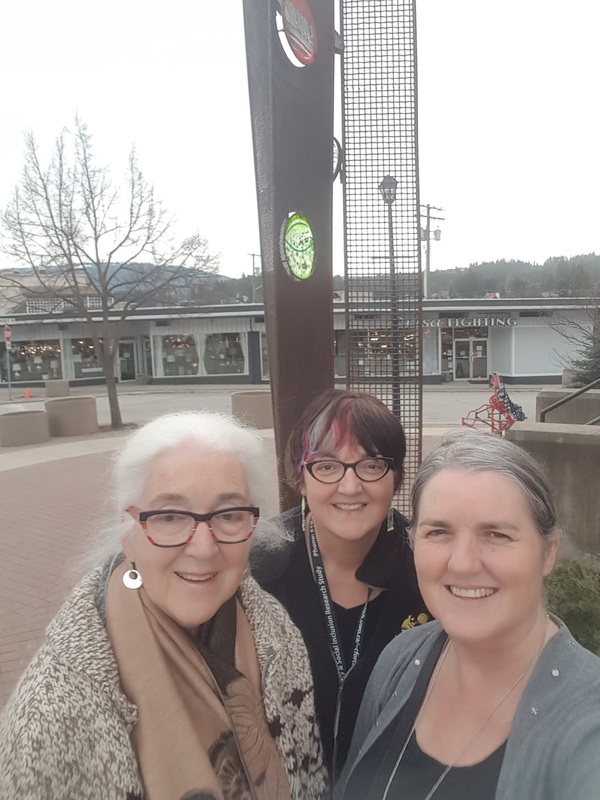 Bonnie and Rebecca attended the Winter Gathering of the Shuswap Tribal Nation in 2017. 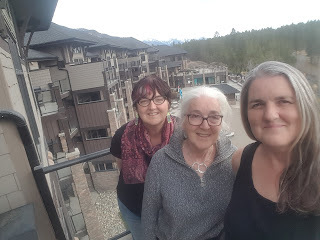 And that is how the road trip started, a four day conference in Invermere. The three of us driving down the highway, one with a latte, one with a green tea and me, so happy to be going to Invermere, a place I never thought I would see. Rebecca doesn’t drive the highway going East from Salmon Arm very much so we kept hearing her gasp about the beautiful views. I think she has been on the west coast so long that she has forgotten the drive through the Rockies. 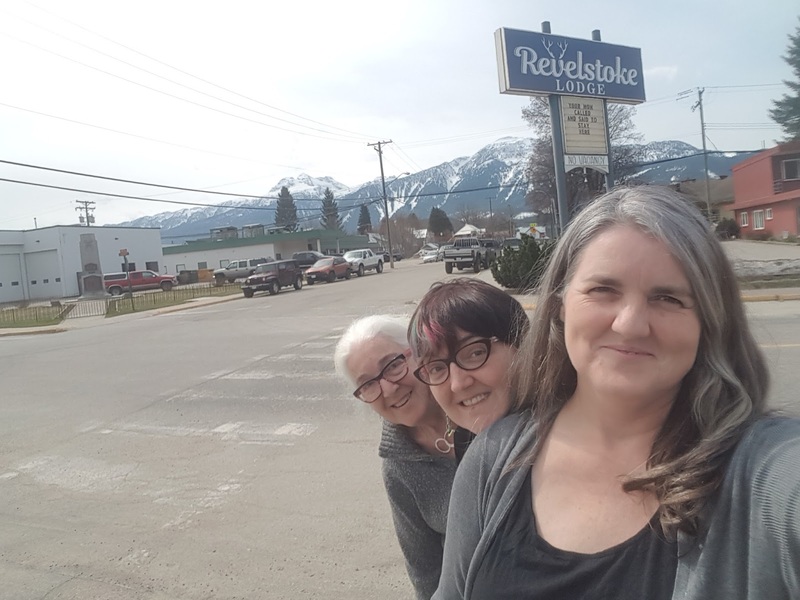 Bonnie showed us a lovely coffee shop called La Baguette in Revelstoke, beautiful brioches and a wonderful fig and date croissant. The shop was filled on the restaurant side and on the take-out side. I think the shop will thrive for the new ski hill there brings in international tourist travel through the winter season. We didn’t know what to choose at the counter. Finally Rebecca said, we are going to do this Wyona-style. Buy one of everything and then share it. She had the clerk cut all of the pastries into four pieces. We ordered a couple of side salads as well. I could tell by the look on the clerks face, that this is the first time she has been asked to do that, but she was happy to facilitate. I saw a couple of new mud slides which caught my eye. We turned south at Golden. The new highway was #95, driving by the Purcells on one side of us and the Rockies on the other side. 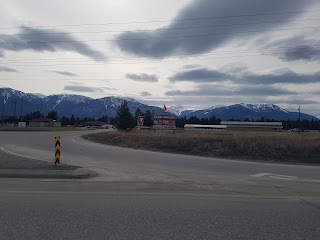 We were headed into the East Kootenays to the Copper Point Resort at Invermere. We pulled off of the highway a number of times. I think it was the beautiful valleys on the Purcell side of the road that captured our eyes. Deer either crossed the road in front of us making Rebecca slow down, or we saw them on the hills or gathering in the valleys. There was even deer road kill along the way, but not ours. 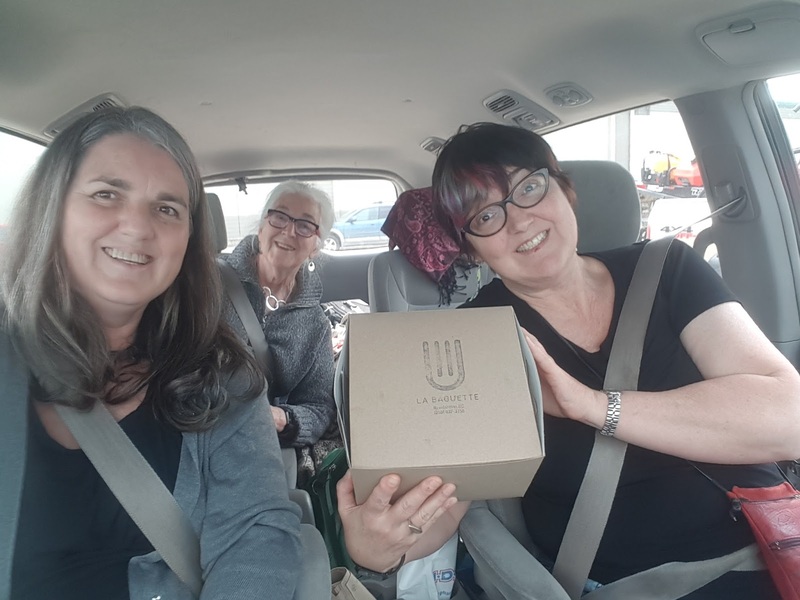 Rebecca had booked a room for 4, the three of us and her friend Jess, from ILRU. The suite we are in has everything. A washer, a dryer, two gas fireplaces, a loft (that holds a single bed and a trundle), a king sized bed, a leather pull-out couch, 2 bathrooms, a fully equipped kitchen and a fridge that holds all of the food that we picked up at Save-On Foods. A good thing Bonnie put back the Teflon frying pan that she was picking up in the store for the omelette in the morning. The kitchen has fully furnished kitchen cupboards, pots and pans, a toaster – nothing is missing. There are fabulous plans for tomorrow, two streams of classes – on the one side, learning about water politics, and on the other side, deer tanning, tea making and sweat lodge making. At the Indian Taco supper, Kenson Thomas was dressed in leather and fur regalia and told “The Story of Sucker Fish”. I have read the story, but never heard it told with all of its dramatic interpretation. I found myself laughing in many of its parts – who knew that coyote was hoping to have a few hickeys before the night was finished? Bonnie Wyora figured out that we only had 20 minutes to get to the hot tub after we had made our way to our hotel room from the gathering. Rebecca and Bonnie swam laps in the outside pool. I just let the water jets of the hot tub do their job on my back. The most unusual part of the day, though not my highlight? There is actually a TV in the mirror in the bathroom. I can brush my teeth and watch TV at the same time. Not that I care to learned to operate that feature, But Rebecca did give me a demo.